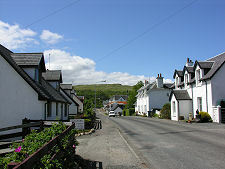 The village of Salen overlooks the Sound of Mull and lies about half-way between the ferry terminus for the Oban ferry at Craignure and the island's main village at Tobermory. 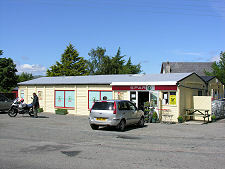 It is also well placed for the terminus for the ferry to Lochaline. Mull's largely single track road network is either an essential part of its charm, or an unwelcome left-over from a world most of the rest of western Scotland left behind decades ago: it all depends on your point of view. But whatever your point of view, if you look at a map of Mull, it soon becomes clear that virtually the entire road network has a single well-defined focal point: Salen. 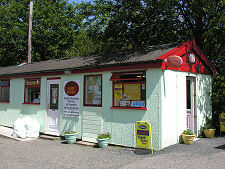 From here you can, obviously, travel up the coast of the Sound of Mull to Tobermory or down it to Fishnish and Craignure. 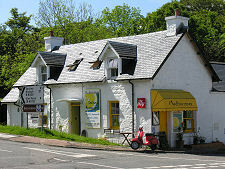 But it is less obvious that the very narrow road which heads west from here past the north side of Ben More is by far the shortest - if not necessarily the quickest - route from northern Mull to Fionnphort and Iona; or that Salen is directly linked to the west coast of Mull and to Ulva; or that the best way to Dervaig from southern Mull is via the minor cross-country road that branches off the main coast road a couple of miles north of Salen. 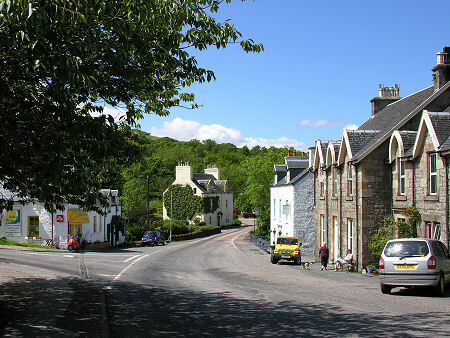 The history of settlement around Salen goes back a long way. St Columba is said to have preached here in the late 500s, though not without, apparently, commenting on how few of the local residents had come to hear him. 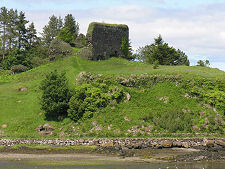 Later development is reflected in the ruins of one of Mull's most important medieval castles, Aros Castle, which still stand on a rocky headland two miles north of the village. 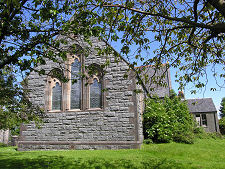 Two miles east of Salen is Pennygown Chapel, which also dates back to the 1200s. But until the very early 1800s, the site of today's village was no more than an unremarkable junction of tracks. 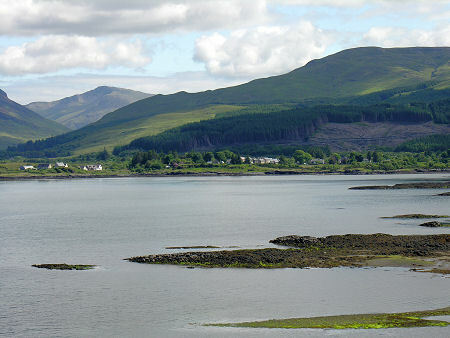 The Laird of Gruline and Ulva, Lachlan Macquarie, decided that there was commercial advantage in establishing a village and harbour on the nearest point on the Sound of Mull to his estates: and so Salen (a Gaelic name that translates into English as "willow") came into being. Lachlan Macquarie went on to become a Major-General and the Governor of New South Wales. 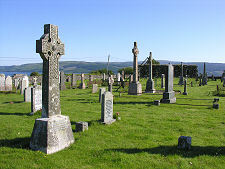 He is buried in the Macquarie Mausoleum at Gruline, two miles south west of Salen. For a century or more, links between Oban and the islands depended heavily on steamers which carried people and goods to a wider range of destinations than are served by today's vehicle ferries. 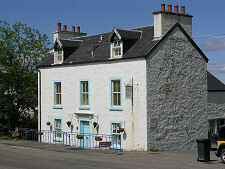 The steamer service from Oban to Mull traditionally went to Tobermory, calling at the pier at Salen en route. 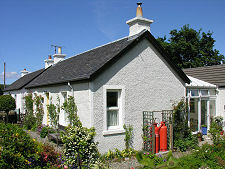 But from 1964 new ferries required bigger piers and the establishment of Craignure as a ferry terminus spelled the end of Salen as a steamer destination. The pier at Rubha Mòr still exists, and it is good to be able to report that after a long period of dereliction it has been restored as a working pier. 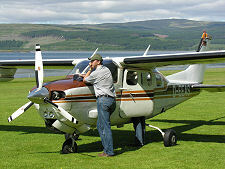 Salen's focal location on Mull played a part in the decision to build a grass airfield at Glenforsa, a mile to the east. 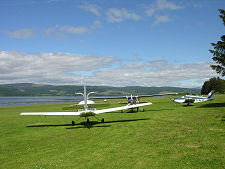 Glenforsa Airfield lays claim to being the prettiest in the UK, and hosts some 400 visiting light aircraft each year, though the air service that originally linked it to Glasgow was displaced by improved ferry services in 1980. Glenforsa Airfield was built immediately in front of the Glenforsa Hotel, a facility not shared by many airfields, and which adds greatly to its attraction for visitors. 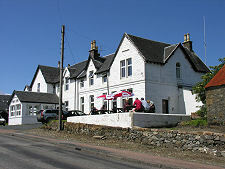 The original hotel burned down in 1968, and was replaced by the building you see today, which was imported in pieces from Norway and assembled on site. 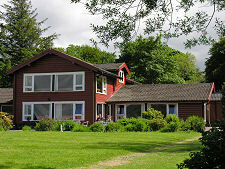 Glenforsa has given rise to one of Mull's most enduring mysteries. On Christmas Eve 1975, a visiting pilot, Peter Gibbs, shared dinner and a bottle of wine with his girlfriend at the hotel. He then decided to go for a night circuit of the airfield, took off, and simply disappeared without trace. The following April, Peter Gibbs' body was found, though without any trace of his aircraft, 400ft up a hill two miles from the hotel. 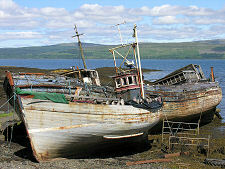 The mystery deepened when, some years later, the wreckage of the missing plane was found in the Sound of Mull, east of the airfield. No-one has ever satisfactorily explained how Peter Gibbs and his aircraft came to end up so widely separated.